Eden Project St Austell - Cornwall The Eden Project is the spectacular site of one of the greatest botanical experiments of all time. These biomes are home to the giants of the forest - balsa, teak and mahogany. Here, you can experience the sights, smells and sheer scale of the rain forest or the sparsity of the desert. Classy Cottages has been at the cutting edge in terms of providing top luxury holiday cottages along the unspoiled coast, between Polperro and Fowey. One of our cottages, Willy Wilcox, is just 11 feet from the sea! OUT OF SEASON, all our large luxury holiday cottages are priced for only 2 people, with an addition charge for extra guests. 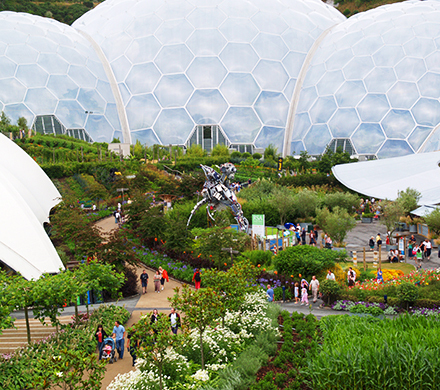 For visiting the Eden Project, the cottages are beautifully situated just eight miles away.